This is a guaranteed real Sperm Whale tooth that is registered with the Department of Commerce as number 21-0230-0005. It weighs 183.5 grams. This beautifully-shaped vertical tooth is 5 3/8 inches long along the curve, and 1 5/8 inches wide at the base. A carefully-etched scene with a female eaglr bringing a fish to her mate is shown on the front surface in a light color wash. The tooth is enhanced by its negative space. (Just click on the picture for a larger view. 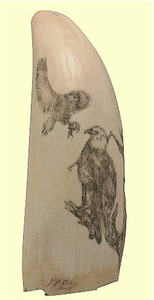 )The tooth is etched in a combination of stippled and line techniques. As an extra option, choose a hand-turned wooden stand. Any collector or bird lover would love to add this tooth to his/her collection!